The wizard Aganhim has overthrown the king of Hyrule and started kidnapping the descendents of seven sages. One of the descendents, Princess Zelda, sends a psychic message to a boy named Link who follows his uncle to the castle. 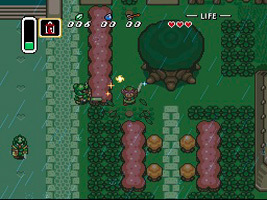 Armed with a sword and shield, Link has to fight his way through the enemy soldiers, solve the puzzles and rescue Zelda. She sends Link on an adventure to reclaim the legendary Master Sword, the blade used to destroy evil. Upon facing Aganhim, Link is drawn into the Dark World, an alternate dimension and home of the imprisoned demon king Ganon. Link must rescue all of the sages' descendents to put an end to Ganon's world-conquering ambitions. In two of the houses in Kakariko Village, you can find portraits of Mario hanging on the walls. The portrait also appears in one of the houses in the Village of Outcasts in the Dark World. 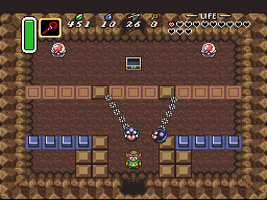 In the Turtle Rock dungeon is an enemy that resembles the Chain Chomps from Super Mario Bros. 3. They are black iron balls with teeth, attached to stumps by a chain. 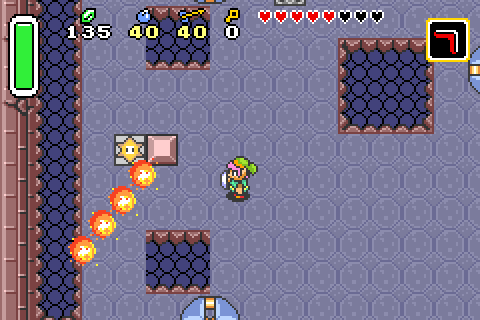 The game also features rotating fire bars, which appear to be based on the rotating Fire Bars from Super Mario Bros. Following a recently translated interview from 1991, a few interesting facts about the enemy cameos came to light. Q. By the way, there were several characters in this game that also appeared in Mario. Was that your idea, Mr. Tezuka? Tezuka: We'd had concept art for Wanwan lying around for awhile. We'd put it aside thinking we might make use of it if we could, but someone discovered it and ended up using it for their own purposes. Q. There were Fire Bars, too. I was wondering if there was some trick to the order of the creation process. Tezuka: To tell you the truth, Fire Bars were originally made for Zelda. They were a lot of fun, so we used them in Mario too. Miyamoto: Now that you mention it, it was Mario that did the ripping off. There were things we couldn't use in the first Zelda, you see, but as time passed and the statue of limitations was about to expire, we thought about using them again and ended up implementing them in this game. Nakago: They were originally made for Zelda 1.